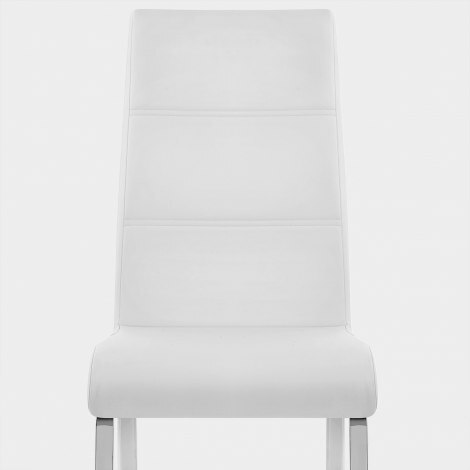 Simple, elegant and stylish, the Sherman Dining Chair White emanates class and modern allure. This charming piece has a clean lined look that adds minimalist style to its location. Choose the Sherman for your kitchen or dining room table and you will not be disappointed. Upholstered in plush white faux leather with segmented detailing, it will instantly brighten any dining area or kitchen. Plus, with a tall backrest and high-density foam padding, it is superbly comfortable. A sturdy four-legged frame formed of polished chrome complements its contemporary aesthetic, with protective plugs included to help to minimise damage to your floors. "Lovely comfortable chair. Worth every penny"
Ordered from Atlantic for the first time, I must say the delivery service was brilliant. The chairs were a very good price, and I must say I couldn't believe how lovely and expensive they looked in my kitchen, they are very well made and well worth the money. I am very pleased to say the least with my purchase and would definitely use Atlantic again and recommend them to family and friends. Thank you. Really happy with the recent Sherman Dining chairs. Ordered them in white and they are perfect. Really pleased with quality and style. Lovely comfortable chair. Worth every penny. Highly recommended, excellent customer service and they were delivered next day. Fantastic chairs - look great in my new flat and great service from Atlantic.